Okay, fist of all, the name of this soup doesn't really do it justice. It is really good, but tastes nothing like a cheeseburger. Combine first 9 ingredients and bring to a boil. Reduce heat cover and simmer for 15-20 minutes or until potatoes are tender. In a large skillet cook sausage, drain, add to soup. Stir in 4 cups milk, heat through. In small bowl combine flour and remaining milk until smooth, gradually stir into soup. Bring to boil, stir 2 minutes until thick. Reduce heat. Stir into cheese until melted. Garnish with Bacon!! *Makes alot. You could freeze half. This is for Kelly. Sorry it took so long. Combine all ingredients, pour mixture in a large skillet or pan. Cook in oven at 450 until brown. All I can say is DELICIOUS! Above is the picture of took of them fresh out of the oven. Sorry...I could have made it a prettier presentation. -Mix flour, sugar, baking soda, and salt in big bowl. -In seperate bowl beat egg, stir in Miracle whip. -Sprinkle choc. chips on top. -Bake at 375 for 20-25 min. This is a recipe I received from my sweet friend Joanie. It is a hit and I have made it a million times since she passed it along. This is my go to dish for when new people are coming over for dinner. I have passed this recipe along so many times. Make Angel Hair Pasta according to the package. Pine Nuts: put on a cookie sheet and place under the broiler for roasting then set aside. These burn fast, so be careful. Put about 1/4 inch olive oil in a skillet and heat on medium heat. Add shallots and garlic. Saute for 1 minute. Add parsley and basil. Add tomatoes. (Doesn't need to be in very long). Drain Pasta. In a large bowl, add pasta, herb mixture, add pine nuts and cheeses and toss together. Okay, before you say "what?" just hear me out. If you have been around our gang very much you know Lindsey, Kimberly, and I cook this at least once a month if not more. It isn't that original, but I had to share it. Red beans and rice will always remind me of sweet times with my family. I absolutely love this soup. We eat it for days on end. It is a lot of chopping, but so easy and so good. In a large soup pot, warm the oil on med heat & saute the onions & garlic about 10 minutes. Add carrots, sweet potatoes, & celery & saute 3 minutes. Add next 6 ingredients. Stir & add water, salt, & pepper. Cover & bring to a boil. Reduce heat to low & simmer 20 minutes. Chips of preference BUT fritos are wonderful with this. 2. Add corn, jalapenos, and jalapeno juice(1/2 the jar of juice). Microwave until hot. You will have to continue to stir and reheat if not hot enough. Add more juice if you want it spicier. You can also bakes this in the oven for 35 min. on 350. Whichever way is faster for you. Hey All!!! All...I mean Y'all!! Ha ha! I made a really good chicken and rice recipe tonight and it was EASY!! It is from the famous "Voice of Truth" cookbook(my mother in law's church...wow...they can cook!). Here it goes! Mix soup, water, rice(uncooked), onion powder, and black pepper in baking dish. Top with chicken(uncooked), sprinkle more pepper on top. Cover and bake @ 375 for 1 hour. Uncover and sprinkle chicken with cheese. Bake until cheese is melted. So here is what I did! Ha ha! I did not have onion powder so I combined minced onion and garlic salt into my recipe. And I did three chicken breasts(don't think that is 1 lb. and a half). I guess it depends on how soupy you want it. I served it with green beans and cresent rolls. You might have to add some salt...but it was tasty! Preheat oven to 350. Grease bottom and sides of a loaf pan. Spoon cheese into a small bowl. Cut each biscuit into quarters. One at a time, dip biscuit quarter into melted margarine, then into cheese. Place coated biscuit quarters into loaf pan and bake for 30-35 minutes. My husband's grandmother, Mama Rose, is so sweet!! Derek says I don't make any of her stuff....and I will tell you why. It is all made from SCRATCH!! Lasagna, brunswick stew, muffins, cakes, etc. Whew!! It is good food, don't get me wrong. But, my goodness...who has time for recipes all from scratch?? So, I am going to try my hardest to start making some of them. This morning I made her Oatmeal Apple Raisin Muffins. Derek loves them and has mentioned to me before about making them. Keep in mind that Mama Rose is diabetic. Which means, that lots of things she makes is healthier for us. Ha! 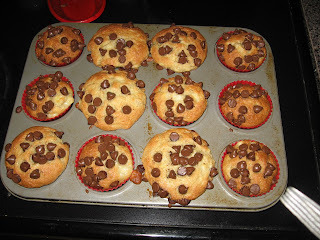 These muffins are a tasty, healthy treat for you and your kiddos. I love muffins! So, it is fun eating them when I know they have ONLY 1/3 cup sugar and apples and raisins in them. Parker, my son, also loved them. I didn't add any butter to the top of his and he ate them like crazy. Beat egg. Stir in remaining ingredients, mixing first to moisten. Pour into 12 greased muffin cups until 3/4 full. Bake at 400 for 15-20 minutes. Serve cool or piping hot with butter.